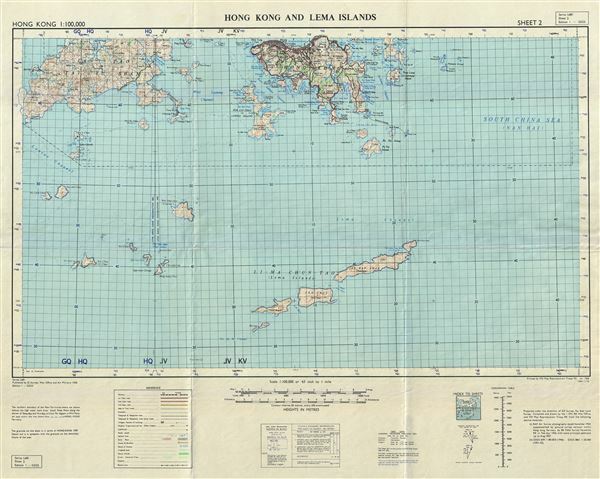 This is a rare 1958 topographic chart or map of Hong Kong and the Lema Islands, China, issued by the British War Office and Air Ministry. It covers Hong Kong Island (with most of the urban development), part of Lantau or Lantao Island, Lamma Island or Pok Liu and part of the eastern chain of the Wanshan Archipelago known as Lema Island or Dangan Liedao. The chart offers outstanding details throughout noting several roads, railways, lighthouses, rivers, islands and a host of other topographical features. Important towns, villages are also noted. This is was a military chart was issued by the British War Office and Air Ministry in 1958 as Series L681 Sheet 2 Edition 1 - GSGS. Very good. Minor wear along original fold lines.